Eleven minutes. That’s about how long it took Steve McQueen, starring as Police Lieutenant Frank Bullitt, to defeat a pair of evildoers while behind the wheel of a Ford Mustang in the hit 1968 film Bullitt. In the process, two bad guys in a Dodge Charger are sent careening to a fiery finale—and, simultaneously, the world of cinema realized a mesmerizing car chase equals box-office gold. Luckily, Ford Motor Company took an important lesson from this movie, too: Nostalgia sells. And the 2019 Ford Mustang Bullitt is rolling proof. This is the third time Ford has brought back a Bullitt-themed Mustang, with the first two having arrived in 2001 and 2008. Just in time for the movie’s 50th anniversary, the latest Mustang Bullitt has the same Highland Green paint job that was sported by McQueen’s 1968 original, along with the two previous throwback models. But just in case green isn’t your thing, it’s worth noting that the new Bullitt is also available in black. The Bullitt shoots from zero to 60 mph in 4 seconds and can reach a top speed of 163 mph. Photo: Courtesy Ford Motor Company. Ford recently provided an entertaining test-drive on the roads surrounding the Bay Area, with one simple caveat: Don’t jump the car over the hills of downtown San Francisco! While scenes of airborne muscle cars make for stunning cinema, attempting the same feat during our tour would be seriously frowned upon. While frustrated over the command to keep all four wheels firmly planted on the ground, we found that the Mustang Bullitt’s nimble handling and powerful V-8 engine still provided plenty of thrills during our day with the car. For starters, this is the most powerful Bullitt model ever produced, courtesy of the 480 hp, five-liter V-8 engine that’s fitted solely to a six-speed manual transmission. This endows the car with 20 more horses than the standard GT model, which should be enough of a gap to satisfy anyone willing to pay the $47,595 starting price for the new Bullitt. Options are few and include such items as active magnetorheological dampers, Recaro front seats with green stitching, and an electronics package that features a Bang & Olufsen audio system, navigation, blind-spot monitors, and a memory function for the driver’s seat. 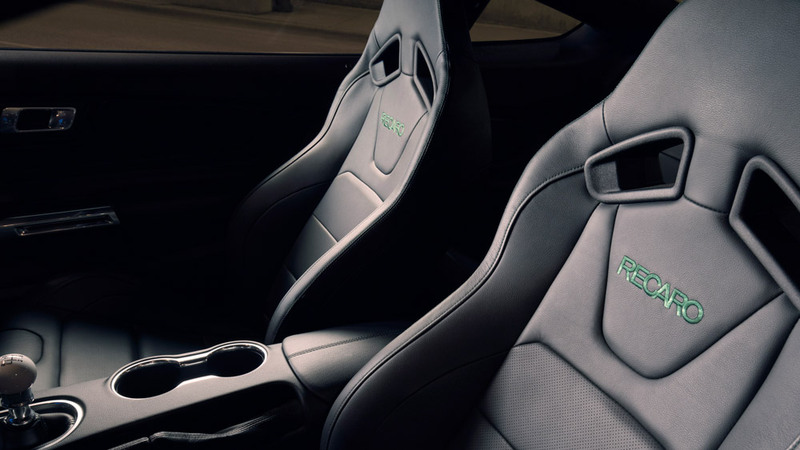 Recaro front seats are an option on the 2019 Ford Mustang Bullitt. Photo: Courtesy Ford Motor Company. Slipping the six-speed into first gear and pulling into traffic, I found the expected weight and heft of the Bullitt to be noticeably absent. Although the cue-ball-like shifter knob might suggest an old-school transmission with a ponderously heavy clutch pedal, the Bullitt’s power train was forgiving (even when traffic slowed to a crawl), and the gearbox is remarkably user-friendly in operation. When the roads started to clear, however, it was the V-8 engine that stole the show. If Ford could bottle the exhaust note of the Mustang Bullitt and sell it by the ounce, the American auto giant could rival the likes of Chanel and Givenchy. It’s an intoxicating sound that’s brought about by the Ford engineers’ careful programming of the engine electronics, along with revised throttle bodies and cold air intake. Whatever they did, this Mustang sounds delicious and throws down the acoustic gauntlet to key rivals, such as the Chevrolet Camaro SS and Dodge Challenger R/T. The car doesn’t simply sound fast; it feels powerful. The engine loves to rev, and stretching the tachometer beyond 7,000 rpm results in a spine-tingling soundtrack coupled with fearsome performance. Accelerating from zero to 60 mph takes about four seconds, while the top speed is listed as 163 mph. We didn’t get to drive quite that fast, however, or launch over any hills, but the Bullitt does hit all the right buttons when it comes to making every drive feel like an epic adventure. A set of massive, red-painted Brembo brakes helps ensure the story has a happy ending when it’s time to wrap up the action. A rev-matching feature on the six-speed gearbox also helps you sound like a hero as you row down through the gears. The Bullitt’s interior combines modern amenities and a few retro refinements. Photo: Courtesy Ford Motor Company. Where does the Bullitt falter? Well, even though the shape of the Mustang is sharp and menacing, the lack of badging (a nod to the original film car) makes it look a little too boy-racer for some. The color palette is also extremely limited—and, if we’re being honest, anyone not choosing green has pretty much lost the entire plot of this car. 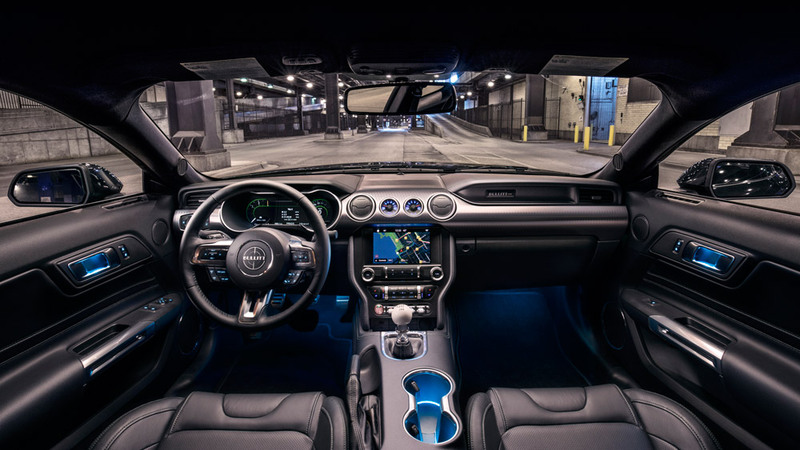 And while Ford is getting more mileage from the Bullitt legacy, there’s no hiding the fact that this car’s cabin is certainly not cutting-edge. But the infotainment system is relatively easy to navigate, if a bit slow to respond, and the optional audio system does a commendable job competing with that sonorous V-8 engine. In addition, the overall layout and materials used in the interior lack modernity, to the point that going to the opposite retro-minimalist extreme seems a viable choice. Just remove the touch screen, any navigation, and the fancy radio, and make every gauge analog. An interior pared down to the bare bones would better suit this car. At the very least, they could put actual aluminum trim across the dashboard, not silver-painted plastic. The Mustang Bullitt is still a remarkably balanced and potent muscle machine, despite some technological and aesthetic flaws. As a daily driver, the available power and exhaust note might be too much of a good thing, especially if you’re not one for making dramatic entrances everywhere you go. 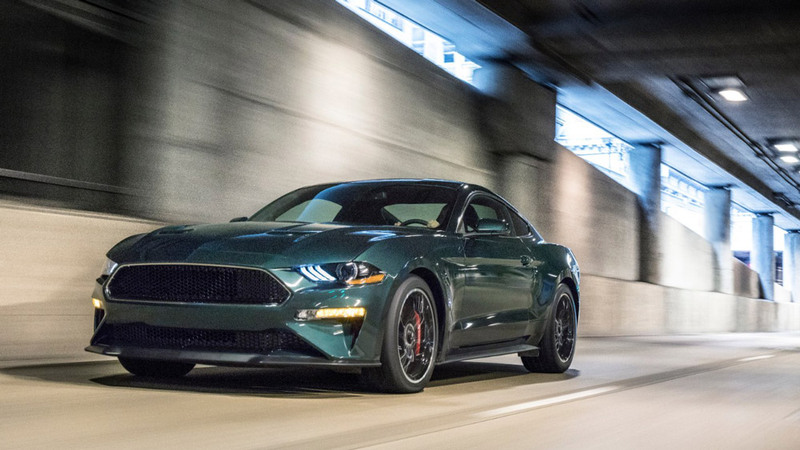 But as a nostalgic twist to another era, the 2019 Mustang Bullitt is a refreshingly fun and exhilarating take on a long-established legend.